The Third Quarter 2009 Survey of Professional Forecasters got a smaller response than normal (only 34 economists participated) but the results are interesting nonetheless. By no means do I endorse the reliability of what this group has to say. On the panel, you have some well-respected forecasters and then you have some industry shills whose sole purpose in putting estimates out is to spin the data. That said, I still try to maintain some understanding of what the groupthink viewpoint is from time to time. In the survey, it seems that growth rate expectations for GDP were actually raised looking out over the next 4 years (2.4% vs .4%), but the unemployment rate is expected to settle down at a higher level than previously expected . This would feed into the idea of the jobless recovery. Philadelphia, Pa. – The 34 participants in the third-quarter Survey of Professional Forecasters, released today, have made upward revisions to their expectations for rate of growth in GDP over the next four years. They project growth this quarter at an annual rate of 2.4 percent, up from 0.4 percent in the last survey. Their expectations for unemployment this year have inched up from an average of 9.1 to 9.2. Unemployment is seen rising to 9.6 percent next year. The forecasters see unemployment falling in 2011 and 2012 — but to levels higher than they predicted previously. Unemployment will average 8.9 percent in 2011, up from 8.7 percent in the last survey, and 8.0 percent in 2012, up from 7.7 percent. For more details, listen to an interview with our analyst. The Survey of Professional Forecasters is the oldest quarterly survey of macroeconomic forecasts in the United States. The survey began in 1968 and was conducted by the American Statistical Association and the National Bureau of Economic Research. The Federal Reserve Bank of Philadelphia took over the survey in 1990. I think the takeaway for me is that I need to look at other examples of jobless recoveries, situations where the unemployment rate lagged even more than usual. 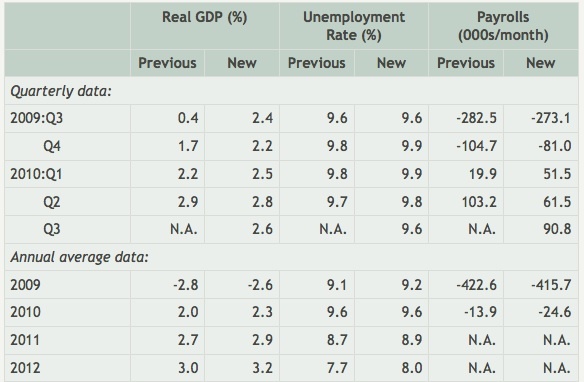 According to those surveyed, we could be looking at a 2012 with 3.2% GDP growth and an 8% unemployment rate! These forecasts will evolve and adjust but still… strange stuff. If this type of scenario is a distinct possibility, it would be nice to be prepared for it. I’ll let you know what I come up with. September 18, 2009 Can The Stock Market Save The Economy? April 14, 2009 When Its Time To Raise Rates, Will Bernanke Have The Stones?